What Type of Awnings will work best for your home? With all the different types of awnings available, it can be confusing on which type you can use on your home. There are many ways awning products that can keep you cool during the summer months and keep your screen porch warm during the winter months. How to keep snow off your porch & keep it warm? We all love screened porches when the weather is good and we would like to use them more during the year. Installing Porch Protection Curtains will keep your porch free of snow and dirt during the winter and the porch will stay warm as the clear vinyl curtains act as a greenhouse effect allowing the sun to shine through and warm up the porch creating another room to use. On colder days they are air-tight enough to hold heat when you use a heater. How to keep rain off a screened porch? Keeping your screen porch dry and clean in the summer is quite a lot of work. Using Porch Roll Up curtains will keep it clean and dry and save you so much time so you can enjoy your porch more. Just drop them down to keep it dry and clean They also help with sun to keep your porch cool. Sunbrella fabrics comes in over 100 colors to coordinate with your furnishings and Sunbrella has a 10 year warranty. How to keep your house cool and energy efficient during the summer? Our sun path diagram will show how the heat enters your windows. Window awnings will keep your house cooler and energy efficient. South Facing Windows –Solar heat gain can be reduced by 65% on south facing windows. It is easy to protect south-facing windows with an awning without sides for all sunlight but the lowest winter sun. In hot climates, however, it might be best to make the awning wide enough or install awnings with sides to block the midday winter sun year round. North Facing Windows– North-facing windows can be protected with awnings without sides too, since the only time the sun impinges on them is early in the morning or late in the afternoon in summer. East & West Facing Windows– Solar Heat gain and glare from direct sun entry can be reduced as much as 77% by adding window awnings with sides to east and west facing windows on your home. In the middle of the morning and afternoon the sun can be low enough in the skies that in can come underneath of the awning if the awning does not have sides. Awnings with sides provide the best sun protection for east and west facing windows. Window awnings are not only attractive, they’re energy-efficient. On a hot day, more energy is lost through one square foot of glass than through an entire insulated wall. Window Awnings will reduce the internal temperature of your home and will reduce your cooling energy bills. Awnings with sides are recommended for most windows, although if you have a direct south-facing window, you can use a side-less awning because the sun’s rays are coming from directly overhead. 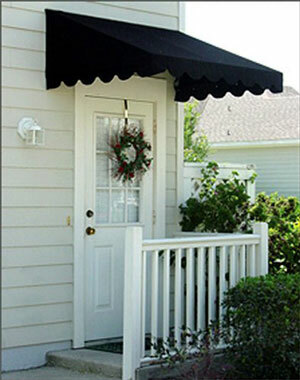 These Awnings will look great on your porch too! Door Awnings are designed to protect you and your home from the weather at your doorways, French doors, and sliding doors. Door awnings are non-retractable and are designed to allow a door to open outward, while giving you full protection from the elements of the weather. Many home owners are realizing that a Retractable Patio Awning creates an upscale, outdoor living room; perfect for entertaining guests or simply relaxing with family. Installing a Patio Awning is like making a low-cost room addition while also adding value to your home. These Retractable Awnings can be easily retracted or extended with a hand crank or motor. Porch Roller Curtains are designed to provide privacy and shade. With the ease of a rope and pulley system, they can be conveniently raised or lowered to any height desired. Porch Roller Curtains are a graceful and simplistic solution of style that will compliment your porch. Valances can add a decorative look to a porch without obstructing your view. They can make a plain porch, look charming. Custom made valances can be made in any length or width and are usually hung from under the side of a porch ceiling. Okay, not an awning, but they sure do look great in a backyard or on a patio or deck. For your home or business they can be customized with graphics and logos. They can be made in any of the Sunbrella Fabrics and Outdura Fabrics too. Coordinate or match them to your awnings and outdoor furniture. Umbrellas will make you feel like you have a resort in your own backyard!